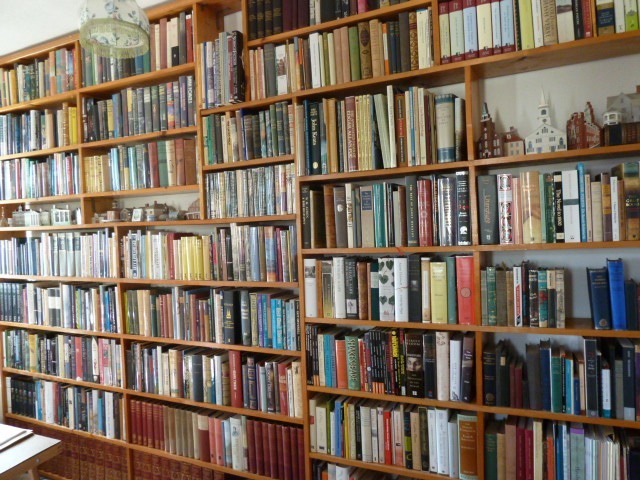 A library may be defined as a collection of books, but unless these are heaped in piles on the floor, it is, of necessity, a collection also of bookcases. 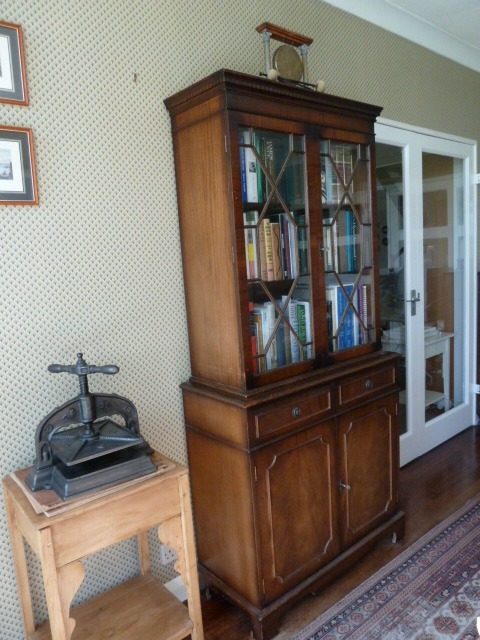 A bookcase has been defined, somewhat prosaically, as a piece of furniture used to store books. 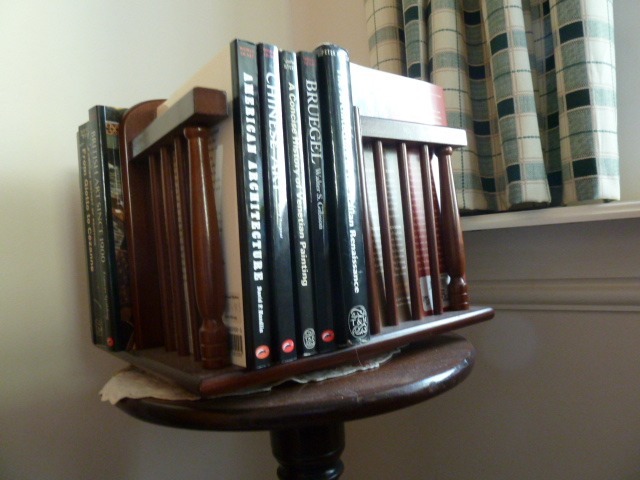 Further, this will almost always be a system of horizontal shelves with books standing upright with their spines facing outwards. 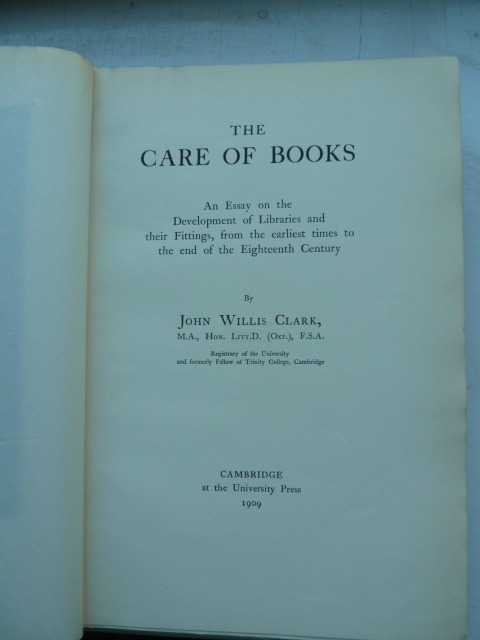 This has not always been the case as the book has evolved from the papyrus roll to the modern codex and conventions for shelving have suffered similar adaptation. 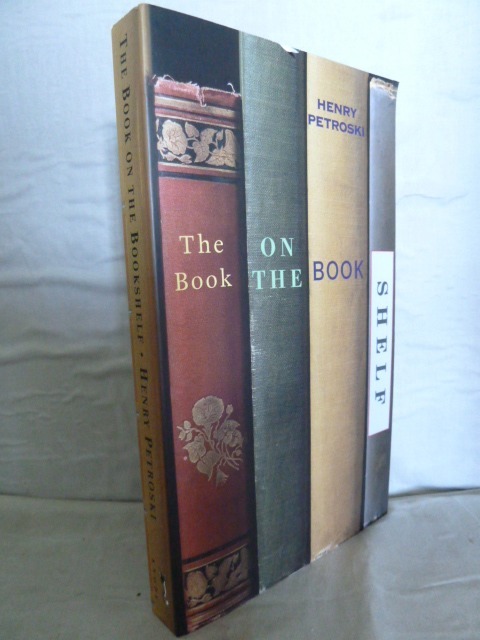 To those thirsting for more, the story has never been better told than in J W Clark's magisterial "The Care of Books", whilst a more accessible version is provided in Henry Petroski's "The Book on the Bookshelf". 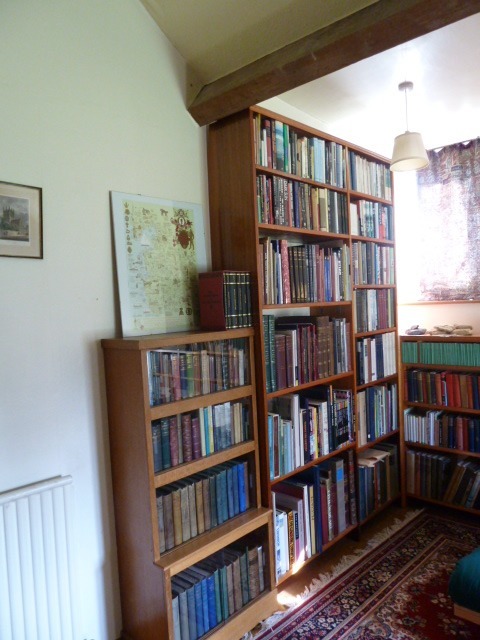 Musing on such matters prompted me to take a tour of our own library and try to summarise how the bookcases and shelves in our house have responded to the constant influx of books over a reading life. 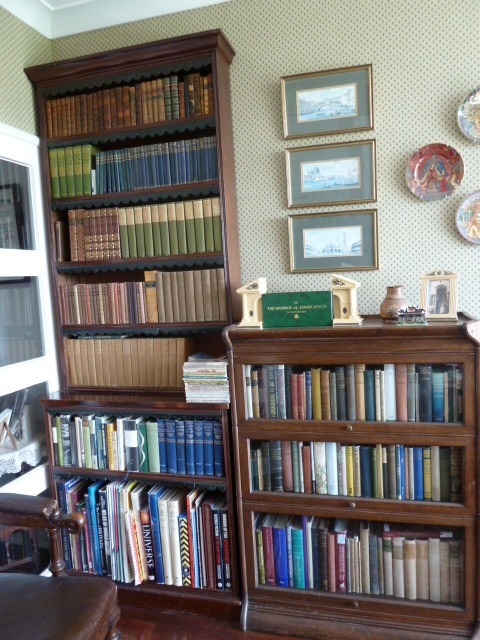 This series of articles began with the Wernicke bookcase of my childhood. 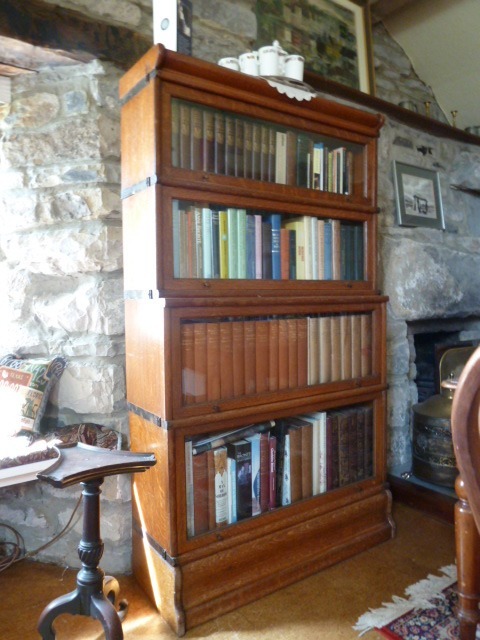 There are four such bookcases in the house, with their up and over glass windows and these are good for housing self-contained special collections (in our case, Bronte, Ruskin and ghost stories). 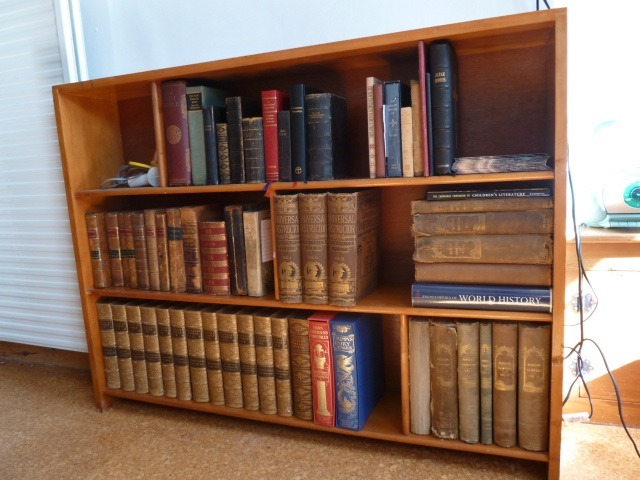 The problem with most Wernicke bookcases is that their shelf sizes tend to limit their contents to octavo and small quarto volumes. 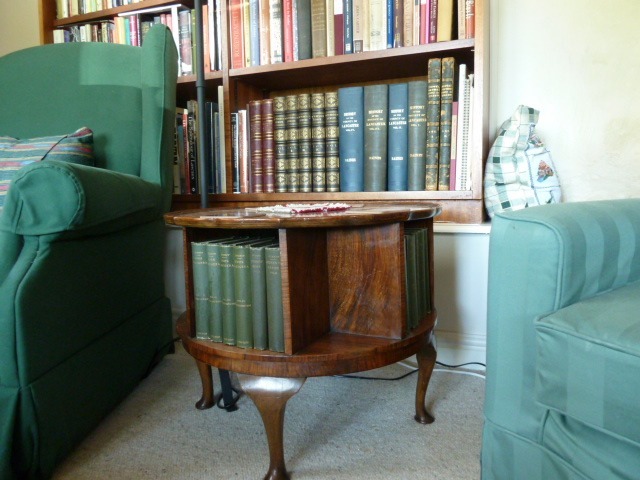 Larger books need something different and we found this, initially, in a Victorian mahogany bookcase, which had a wonderfully deep and high bottom shelf and several narrower shelves. 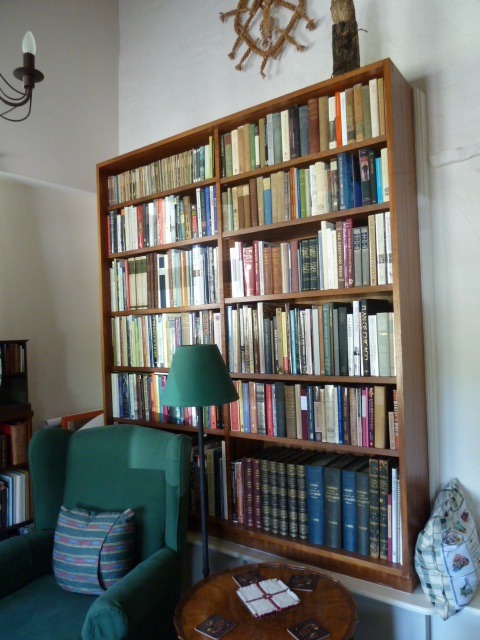 However the time came when our books demanded something more than second-hand bookcases, however elegant, and so we embarked on building our own shelving, from floor to ceiling in, first, a room dedicated to books and, now, in several rooms and corridors. These shelves are exclusively built from planks of parana pine with shelves supported from the uprights by simple metal brackets. 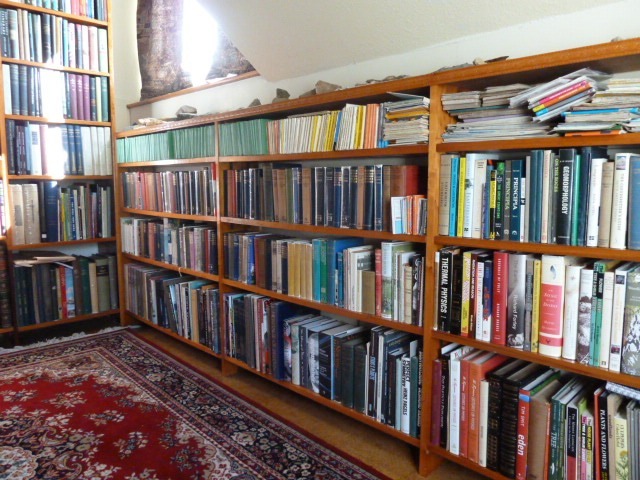 To avoid shelves sagging under the books, wood of order one inch thick is needed with shelf spans never more than four feet. 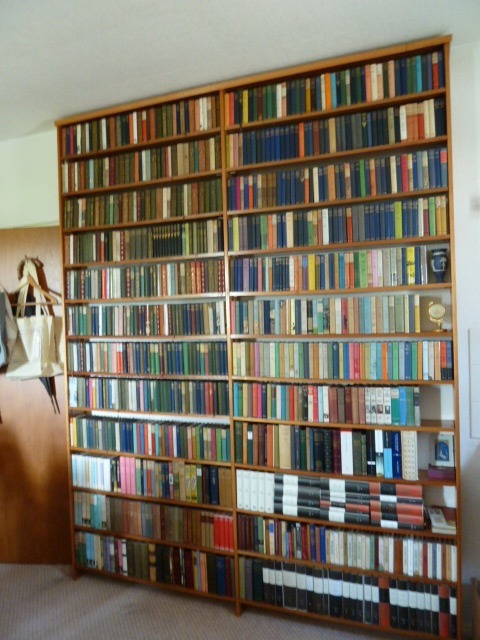 Now, the shelves can be spaced according to the books, a bibliophile's dream! 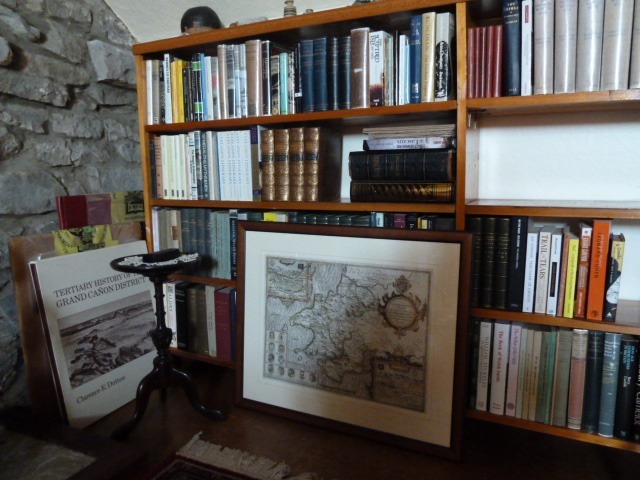 As to shelf width 9 inches is normally fine; we, do, however, use 12 inches for one of the bays, for larger volumes and 6 inches for paperbacks and our collection of 'World's Classics'. Another input to our book space came when the Carnforth Bookshop closed its short-lived branch on Church Street, Lancaster, when, as the shop was being cleared, we hired a van and took some of their shelving (we also have some Borders shelving,following their recent demise in the UK). 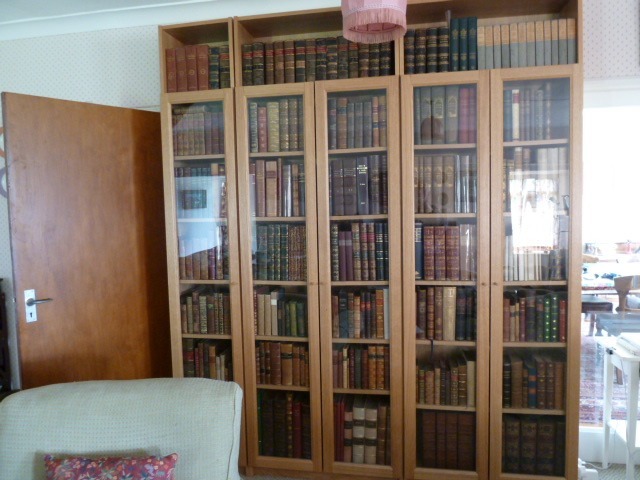 In recent years, we have become aware of the excellent IKEA Billy Bookcases and several of these have migrated from the local store into our house. A great attribute of these is that you can affix glass doors to them and they do then present a very handsome appearance, particularly several side by side. 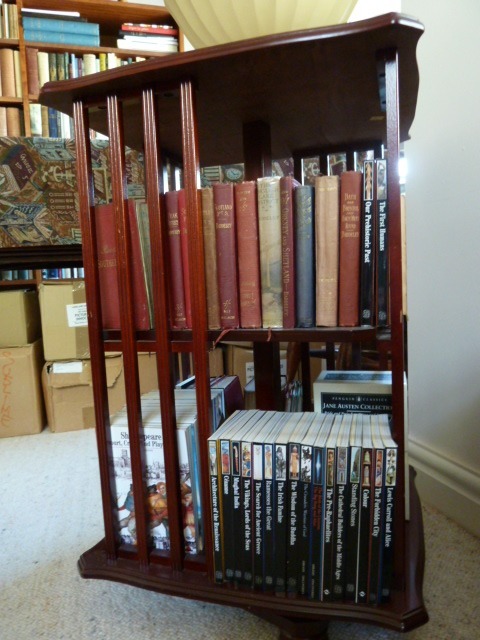 Again, with adjustable shelf height and deep shelves there are not many book sizes that they cannot accommodate. 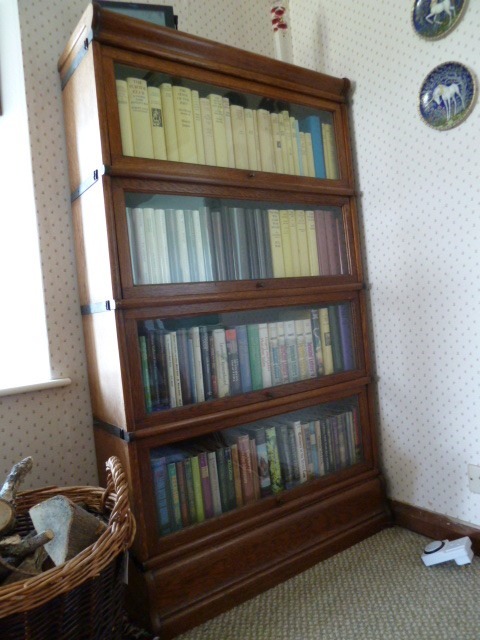 I have mixed feelings about books behind glass, but on balance keeping dust away from a book is probably the single greatest act of kindness you can bestow on a cherished volume. 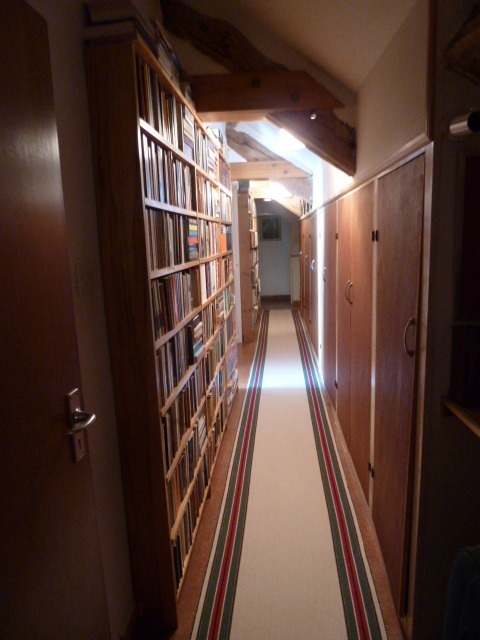 Books on open shelves require dusting along their top surfaces at least once a year to prevent build up of mould. 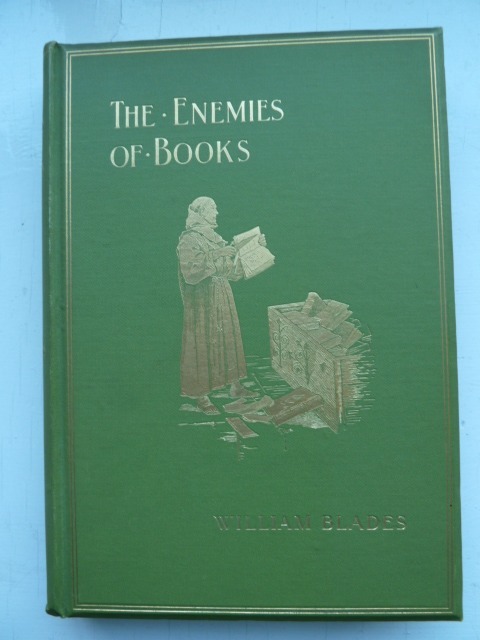 And just in case you think I am paranoid see "The Enemies of Books", by William Blades. 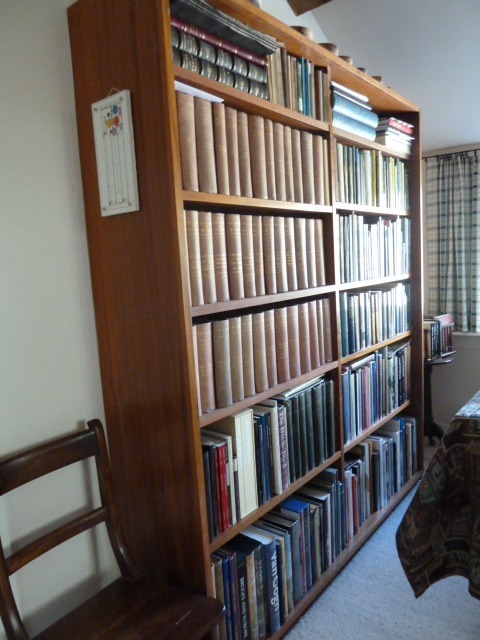 It only remains to draw attention to one or two of the other bookcases that live in odd corners and accommodate particular micro-collections. 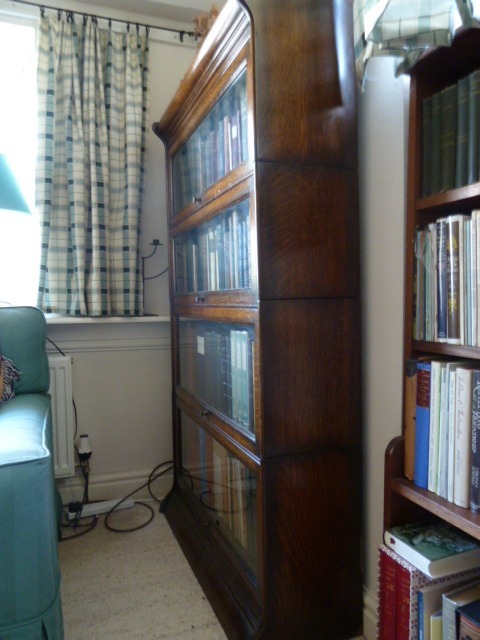 And finally a display cabinet, with the upper part used for a small special collection. 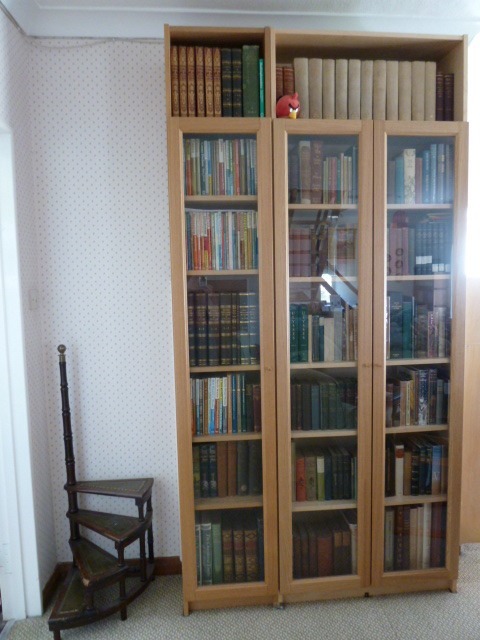 The question may arise as to what happens when literally there is no space for a single extra book, let alone bookcase. Moving is probably the best fix.